Mark: Hi, it's Mark Bossert, producer of the Pawlik Automotive Podcast, here with Mr. Bernie Pawlik, the big bopper himself, here in Vancouver, talking about cars. How are you this morning, Bernie? Mark: So, the 2004 Porsche Cayenne had a problem starting. What was going on with this vehicle? Bernie: So, this vehicle was towed to our shop. When you turned the key, all the lights would come on on the dash, and everything seemed normal, but when you go to the start position, nothing happened. There's no clicks, no clunks, nothing. So, basically, it was a no-start with what seemed like to be a good strong battery. Mark: What did you do to diagnose the problem? Bernie: Well, of course, the first test is to verify that the battery is, in fact, good. From there, we proceeded to do some scan tool tests to make sure there weren't any issues with, say, the security system or with the ignition key, anything we could see on the scan tool. Nothing was apparent. I mean, there are a number of things that can cause a car not to start like this, and on a really simple car without any security system, you know, something like this, you'd suspect maybe the ignition key or the starter or something would be bad because it's a pretty simple circuit. But on something like a Cayenne, and a lot of vehicles, the security system, if there's something going on with that, an issue there, it could cause the vehicle to simply not to crank over. So, we verified that was all good. Went to do some tests on the starter, and we basically found that the starter itself was dead. Mark: How is starter replacement on this vehicle? Bernie: Well, it's a lot of work. The starter is just beautifully laid out in the valley ... it's a V8 engine. The starter actually sits in the valley between the two cylinders buried under the intake manifold, the coolant pipes. There's a lot of stuff that needs to be removed. It's a great use of space, but when it comes to replacing the starter, it's really not that good. Let's just get into some pictures because I've got some neat stuff to show you here. There's our Cayenne. 2004, older model of Cayenne-S, which is the V8 model. Just let me work my way through these pictures here. So, there's the ... If you were to pop the hood open under this vehicle, and you look at the engine, that's the engine. The intake manifold is here. There's a lot of plastic covers all around to hide all the nice working components of the vehicle for the visual experience of just the engine only. 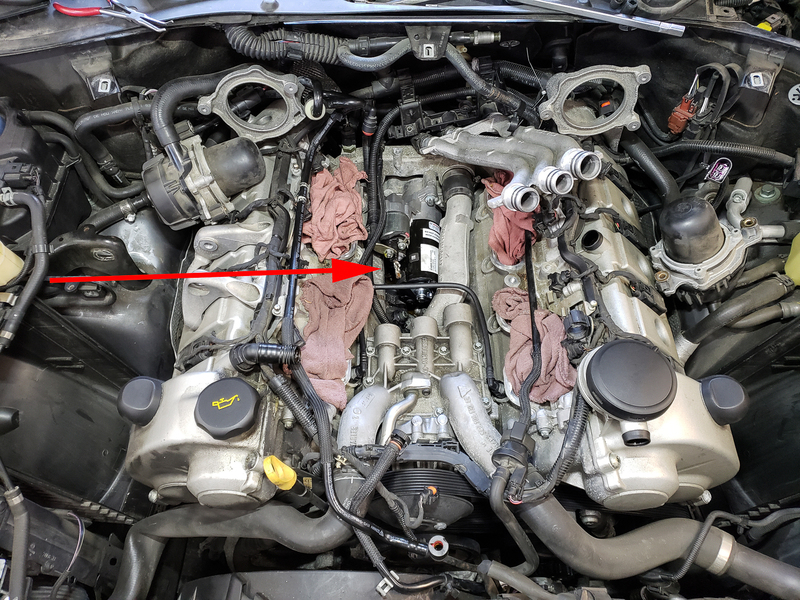 There's covers that need to be removed here, and as we go further with the intake manifold removed, everything, all the covers removed, we get to the starter motor, which sits right down in this valley here underneath these coolant pipes here. You can see a lot of bits and pieces have been removed. The intake manifold, the black round pipes were all sitting on top here. These rags basically cover the intake port so nothing, of course, falls in between that would get sucked into the engine and cause some nasty problems. So, there's the starter right there. As I said, it's a great use of space, but when it comes to replacing it, it's not exactly a great place to do it. Mark: So, on most American V8s, the starter is down below and underneath, basically, the pistons and close to the crankcase? Bernie: It’s really at the top, yeah, and it's not the only vehicle. There's Cadillac's that have this type of design, as well. So, you know, it's not a Porsche-unique thing, but, you know, it's certainly, as to say, it's not the best place to remove the starter. Whenever we replace these, of course, we do put a warranty on our work. I always hope this is not the kind of warranty job that ever comes back because it's a lot of work for us to replace it. One thing about electrical parts, they are probably a more common failure. I hope I'm not jinxing this repair by saying this, but they are. Starters and alternators seem to be one of the more common failure items that we repair. Just by the nature of what they are, they're electrical components. They do tend to fail a little more frequently than other parts. Sometimes they'll go for years, but the failure rate is a little higher. There are new ones available. I mean, it used to be traditionally, you'd always replace it with a rebuilt part. There are brand new ones available, and we have used them, but we tend to find that a lot of these are cheap Chinese manufactured parts that actually the brand new ones don't even last as long as the remanufactured original components. So, we've actually just pretty well stick with a good brand of remanufactured component. Mark: Not that Chinese components can be inferior, just sometimes they're made more cheaply as for budget reasons. Bernie: Exactly. And I hate saying cheap Chinese because I mean, I remember when I was young, and you'll probably remember too, they used to say Jap Crap. It was like, Japanese manufactured products were bad. I mean, when you look at Jap, maybe they were in the 1960s, but I mean, they just rocketed forward in quality. I mean, nobody ever thinks that anything Japanese is being crappy, and no one has for a long time. And the thing with Chinese, they make a lot of stuff, and a lot of it's good, but there's just a lot of low-standard manufactured items, and ... undoubtedly, I mean, look at a lot our smartphones are made in places like that, and the quality of those is pretty good for most of them. Bernie: Absolutely. Absolutely. So there's lots of great Chinese stuff, and so I probably should take the cheap ... so, we'll just say cheap offshore ... Well, you know. Bernie: Poorly made, cheap quality. And you know, this is the thing we often battle in our industry is what are the economical things to buy? I mean, if you buy the part from the dealer, you'll pay a huge amount of money, and often, it's not worth the extra amount of money. And many of their components will be remanufactured anyway, so you just hope that their standards are high. Anyways, so yeah. So there's the starter location. We have one more picture to look at, and that is the coolant pipe, so the coolant pipes sit over the top of the starter, and then, of course, you can see now the rags have been removed, you can see the intakes parts. So, the next step in the installation here is to put the intake manifold over top and then put these air pumps back in and all the other covers and bits and pieces, and then away it goes. Mark: So, don't these vehicles have problems with leaking coolant pipes? Bernie: They do, and they did. The coolant pipes used to be made of plastic on these earlier models. I'm not sure when they stopped making it. Probably, maybe '07 or something like that. But the original coolant pipes were plastic, so these have been replaced, and they would fail at an alarming rate at a very early age. A lot of engines died an early death because of that because the coolant pipes would leak, people wouldn't deal with it, the engine would overheat. Yeah, not a fantastic design, and not something I'd expect out of such a high-end expensive car. Mark: Now, what was wrong with the original design of coolant pipes? Bernie: Basically, plastic. You know, the plastic ... They were made of plastic. They'd expand and contract, break, shrink, and basically, they just contributed to leakage. The new metal pipes, of course, they have o-rings in each end, that you know, the metal isn't subject to the same forces, and it's much more durable. Mark: After this extensive amount of repairs, how was the Cayenne? Bernie: Oh, it was good. Yeah, started fine, ran great. This vehicle ran quite well. There are a lot that don't seem to. You know, over the years, we've had a lot of Cayenne's with engine problems, again, possibly overheating. They're kind of loud, noisy engines, I find. A lot of times when they run and you rev them up, you go, "Oh, something's wrong with this," and yet it's actually normal. So they're just kind of a loud, noisy engine. Mark: And how are Porsche Cayenne's for reliability? Bernie: You said that very well. Not Porsche, Porscha. It'll keep some of our fans happy. Mark: They're never happy, come on. Bernie: Yeah. Yeah. There's always some people with… Anyways, you know, I'd say overall, I'd say they're not the most reliable vehicle. I mean, things like as I was mentioning, the coolant pipe issues they had, the noisiness of the engine, they're not the easiest vehicle to service. I mean, a battery replacement involves removing the seat to take the battery in and out. Again, this isn't unique necessarily to this vehicle, but they're just a lot of ... they're a very complex vehicle. I'd say they were probably rushed into production at the beginning, so they had a few problems. I think they've got a lot better over time, but I don't know. You know, to me, they're not my favourite, and to me, a Porsche, like a 911 is kind of like the best car. A Cayenne, while it's a nice vehicle, it's kind of a disappointment, but of course, you can haul five people around and some stuff whereas a 911, you can only take one person, so. And not a lot of stuff. So, it's not as practical, but, yeah, I'd say they're not the most reliable luxury SUV. There are probably better choices out there. Mark: So, there you go. If you're looking for service for your Porsche in Vancouver, the guys to see are Pawlik Automotive. Pawlik Automotive. You can reach them at 604-327-7112 to book your appointment, or check out their website, pawlikautomotive.com. We have hundreds of videos on YouTube. Search for Pawlik Auto Repair, or, of course, thank you so much for listening to our podcast. If you're calling from somewhere else in North America, we don't diagnose your vehicles over the phone. We don't feel that's an integrity, so if you're in Vancouver, call us for service. You must book ahead. Thank you for watching. Thanks, Bernie. Bernie: Well, thanks, Mark, and thank you for watching. We really appreciate it.